Authors of some blog posts on the Internet deprive software engineering of the right to be called an engineering discipline. They like to give examples of how accountable and responsible real engineers are and how reckless are software engineers. As a person who spent 7 years in university learning different areas of math in order to become a software engineer I find those statements preposterous and insulting. At the same time I have to admit that a lot of practices that I see in the industrial software engineering give some ground to those statements. I arrive to a conclusion that even if software is an engineering discipline not everyone practices it as such. After ten years in the industry I’m disappointed by how things are usually done. The experience that you gain doesn’t elevate you. You keep running into the same issues that you need to troubleshoot over your weekend. There is no tradition to follow the principles of design that would allow developers to avoid those mistakes. Andrew Hunt and David Thomas discuss these principles in their book Pragmatic Programmer. I’ve never seen those principles applied consciously in practice. Notorious user’s convenience drives design processes instead of mathematical purity. For some reason developers assume that their software will be used by brainless monkeys. Software developers can decide to use a library without fully understanding the characteristics of the library. It’s unheard of in any other engineering discipline to use a material with unknown parameters. Software is one of the most complex systems we’ve ever dealt with in the history of mankind. The horizon of available programs and libraries constantly expands. In these circumstances programmers are forced to deal with uncertainty. Writing a new piece of software is like sending a moon probe. Every time we argue whether the Moon is solid. Fashion and market opportunity drive design decisions. The industry is not set up to make conscious decisions. We have many products with similar characteristics. Software community keeps creating new versions of the same thing introducing the same problems. Why do we have five different databases?! Every new database claims to be better than all previous ones. After building the new database its developers create connectors to old databases. They want to be a part of the community. Otherwise the inertia will spew them. From outside it may look like conspiracy theory. Programmers create jobs for themselves. Companies waste their resources picking among all possible options or maintaining all of them. In these cases I like to say that there is no need to look for conspiracy where you can explain everything with negligence. Instead of creating five databases or even creating one highly configurable database we need to create medium sized components that allow us to quickly construct any of those databases. Every creator of a new database who realized another use case where the database can be useful should go back and break existing databases into smaller pieces with his new understanding of the domain and build his new database with some more approaches. Every creator of a new database should go back, break existing databases into smaller pieces, and construct his database from those pieces. This approach may not be the fastest for him. But it will pave way for the future database builders. They will have components more suited for constructing for databases. Of course no venture capitalist will fund years of refactoring of old databases in order to build another one in one day. In this situation I see open source as the solution to this issue. Only the users of the software themselves can build the right tool. They won’t care about marketing their tool. They will use this tool themselves. They know what they need. It makes the process of software development very similar science. Unlike what software engineering does to programs, science refines and expands its theories. Many people tend to compare software engineering to manufacturing process. I find this comparison inaccurate. Software engineering is more like design process. In manufacturing you need to create blueprints specific to the manufacturing line. Similar parts need to be redesigned for different manufacturing lines. Software engineering has this unique ability to reuse blueprints without implementing them in the physical world. In software engineering every blueprint is already a product. This product is very malleable. As such, it doesn’t make sense to create another blueprint if you already have one. You need to go back split the initial blueprint, pick the parts that you need, complement with missing part, and ship your new product. You product will consist of parts of old blueprint and new blueprints. In science we add layers of knowledge on top of existing layers. We restructure existing knowledge, but we never recreate existing concepts. Nobody has several implementations of Newtonian physics where gravity works slightly different in different implementations. Software engineering should employ similar approach. Reusable implementations of existing algorithms that can be assembled into anything we want like Lego bricks. Modern programming languages are a break through in this area. But we still have a huge gap between the abstractions that modern languages provide and library primitives. Languages give us too small abstractions. Libraries give us too big abstractions. The great number of different languages only inhibits the formation of this middle layer. So, let’s start picking our tools and libraries carefully without creating redundancy. Let’s tear existing tools apart in order to create new tools from those parts. Those smaller parts in their turn can serve somebody else in their projects. And we need to have one language that is truly universal. We don’t have such a language yet. This language should produce truly composable primitives. So far it looks like Haskell is the one. Though the language research is still in progress. I’m happy to report that in recent years great software with focused purpose started emerging. I would like to endorse suckless tools. They provide truly reusable pieces of software. Xmonad and similar minimalistic window managers perfectly complement suckless tools. These programs allow you to build desktop environment that can evolve with your understanding of efficient workspace. Unix philosophy is another great example of how composable programs can be built. It looks like there is a way. We just need to try harder. I’ve come to understanding that most people organize things like if they were disassembling a car: 5 inch screws in one pile, 3 inch screws into another pile, nuts in a third pile, etc. This is the approach that comes first to our mind when we need to organize something. However it’s not the easiest way to make sense of the whole system if it’s structured this way. The whole system looks like several boxes with nuts and screws of different shapes and sizes. Another way to do it is by structuring the whole system as interacting entities. Screws and nuts from engine go into one box. Parts for suspensions system and wheels go into another box. This way we see functioning elements instead of piles of smaller parts. Let’s discuss each of the approaches in details below and with some examples. In this context let’s think about the whole system and several entities standing side by side or as a tree of objects. A good example would be a row of people. The first approach I call horizontal, the second - vertical. The first approach thinks about this row of people as several buckets: one bucket with heads, one bucket with hands, one bucket with bodies, one bucket with legs, and one bucket with feet. Not only imagining it is unpleasing it’s also disfunctional. Parts in each of those buckets have very little, so called, cohesion. They don’t interact with each other. They are useless. They just lie in those piles. This obviously preposterous structuring in this context finds surprisingly wide support in software engineering. People create a separate package for exceptions, a separate package for utility classes, etc. Also instead of sealing logic inside of one class it gets spread among several classes. This approach leaves little room for encapsulation. Classes and packages have to make every its member public, because everyone outside this package or class needs to interact with their members. Setters and getters are considered the summit of encapsulation in such an environment. The only argument in favour of this approach is that it’s obvious how to use it. It may have place if these moving parts are already in a relatively small box. One box for engine and then smaller boxes inside this one for engine’s screws and nuts. The other approach I would call vertical slicing. Vertical because it thinks about a row of humans as several buckets - human one, human two, human three. These bodies can’t interact with each other by any means other than defined by public interfaces for these bodies. The liver of one body doesn’t interact with the heart of another body. Thinking about your classes and packages as living creatures rather than a buckets for screws and nuts helps a lot with encapsulation of the classes. The internal state of those classes can be hidden by conventional java’s access control modifiers. If all the moving parts of one entity are colocated in the same package it’s easier to find them as you are reading the code. Each package or class in this approach should be as a small library that provides functions and has a public interface. When I’m writing code using this approach I’m asking myself whether I can extract this package into a library right now. Once I actually need to extract a library from the project is easy to do so. It’s interesting that this idea is also applicable in other areas of software engineering. Scrum advocates for vertical slicing of teams. Scrum teams are supposed to be cross functional and cut through all layers of the product, so, that one team can deliver any functionality. It’s also a popular tendency to slice teams horizontally. It leads to enormous amount of dependencies between teams and chaos when delivering a feature that has parts in each of the layers. Let’s take a look at some of examples when the choice between these two approaches is not particularly obvious, but very important. A perfect case when people get easily confused how to group classes in packages is translation of an AST. If you have an application and different parts of it need to translate this tree into different things then you naturally get an interface for Visitor for this AST. The tendency to put alike with alike leads to a confusion. Should implementations of the Visitor interface be stored near AST definition or near the services that use these implementations. When this question arises I’m thinking about the dependencies that each class has on other classes as lines between classes. When we move classes from package to package we want to minimise the number of lines crossing the boundary of packages. Three dependencies go through the boundary. Two dependencies go through the boundary. In this particular case thinking about this AST tree as a library helps a lot. The interface Visitor should be stored near the AST tree structures in a separate package and the implementations of this Visitor interface should be stored where they are used. It also minimizes the number of dependencies going through the boundary. Engineers also tend to put all bean declarations in one configuration bean at the top level of their applications. Here I can say that if the classes inside the package don’t rely on IOC container then it’s a perfectly normal practice, because they don’t depend on the defined beans and the main application considers these classes as plain java objects. However if the classes inside the package expect some IOC container to be in place then it makes sense to put another configuration class inside the package because it helps with understanding how classes will be wired together. Builder pattern seems to be one of the most versatile patterns of all creational patterns. Its role is usually underestimated and it usually goes unnoticed among other easier for understanding creational patterns: Abstract Factory, Singleton, Prototype. Further I suggest to review some of variations of Builder pattern. In certain cases the variations bring the pattern closer to Visitor pattern. In other cases the modifications bring it closer to Abstract Factory pattern. Nevertheless the way it is used stays the same. All the variants give us fine tuned control over the dependencies and modularity of the code where the Builder pattern is used. Builder pattern separates the process of construction of a complex object from its representation. So that the outcome of the same process of construction can be different. In this case the main application will be a client. The collector of the data for the diagrams will be a director. The construction of concrete charts(pie chart, histograms, line chart) will be done by a concrete implementation of builder - a class implementing ChartBuilder. This usage allows us to abstract out the process of construction from the concrete implementation of the object being constructed. In common practice we can encounter modifications of Builder pattern that allow us to manage dependencies inside the project in various ways. The modifications fall into different categories based on the location of GetResult method call and on the number of directors. Variations of Builder pattern can be classified based on the location of GetResult call. GetResult method can be called either from the director or from the client. If GetResult method is invoked from the client then this variant is for abstracting out the director from the implementation of resulting object as it’s represented in the classic case. In this case the result is required by the director itself, but the director doesn’t know the implementation. If the client doesn’t invoke set-methods of the Builder then this implementation of Builder pattern can be replaced with AbstractFactory. In the case when a part of the director should be configured before passing it to the director AbstractFactory is not suitable because it focuses on synchronous object construction. In this case Builder pattern is the most suitable option. Variations of the pattern can also be defined by the number of directors. There may be no directors. In this case Builder pattern is used as a constructor with named arguments. Client and director are the same entity. 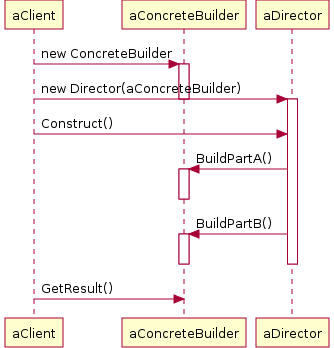 If there is one director then it leads us to the classical variant of Builder pattern for abstracting out the product construction from its concrete implementation. One of the main reasons to use Builder pattern - inversion of dependencies. The builder is passed to a director during construction, what ensures isolation of the director from the implementation details of concrete builder. Another reason as it’s specified in  to use Builder pattern can be a lot of arguments of the class being constructed. Let’s take a look at a piece of sample code. From this code it’s clear that value1 becomes A in the new product, and value2 becomes B. It allows us to change the order of arguments in the invocation. Named arguments make the code more readable. The invocation of method GetResult is done by the director itself, which is also a client. 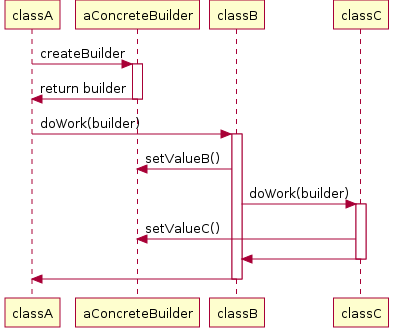 Builder’s role here is similar to the role of AbstractFactory pattern, but unlike AbstractFactory pattern, who’s task is to give access to construction of construction of a group of connected objects, Builder is focused on construction of instances of only one class. This pattern also allows us to configure builder as we receive data necessary for configuring it. So the construction can lapse in time instead of happening at once as it’s done in factories or constructors. Builder pattern tracks the consistency of the object being constructed and if some of the arguments are missing it can throw exceptions or execute any other action required to inform about the incomplete state. This approach also allows us to loosen coupling between classes. Each class can set only the arguments this class is aware of and pass the builder further in the chain of construction. The classes only need to know about the structure of the builder and don’t need to know about each other. They also only work with the methods they need to know of and don’t need to care about the rest of the builder. This usage of Builder pattern makes it very similar to Visitor pattern. Then method GetResult can be invoked when the builder is returned back to the client from the chain of invocations inside directors(in the beginning of the chain) or by the final director(end of the chain). If Builder pattern is used as in sections Loosening Coupling and Several Directors then if we need to collect more data we can use new methods only where they are required keeping the rest of the chain of directors intact. Instead of getting data through get methods sometimes it’s more flexible to pass Builder pattern. Let’s illustrate what we described above in the case for several directors. Method GetResult can be invoked by classA as well as by classC. In both cases classA and classC can’t know anything about each other’s dependencies, what reduces dependencies of each of them, but gives them access to the required object. In addition to that classC receiving partially configured, can change only the part he knows about and as a result receiving different objects depending on the requirements. The latest approach is particularly convenient, when the client class requires different instances of a class depending on the data that client class has, but IOC container restricts access to constructors. Builder pattern is a sufficiently powerful and flexible instrument for dealing with dependencies inside a project and inversing the dependencies. Regrettably, the usage of Builder pattern requires writing a lot of boilerplate code. It complicates effective usage of this pattern in modern programming languages. As Rob Pike appropriately mentioned in his presentation at OSCON 2010: patterns - are usually solutions whose implementation is missing from the language. We can only hope that working with builder pattern in future languages will be as simple as just writing a constructor. Erich Gamma and others. Design Patterns: Elements of Reusable Object-Oriented Software, 395 p.
Bloch J. Effective Java. Second edition. Prentice Hall, 2008. More on getters and setters - JavaWorld [Electronic resource]. URL: http://www.javaworld.com/javaworld/jw-01-2004/jw-0102-toolbox.html (date of access: 06.02.2011). I started my long path into the world of computing in norton commander. Then I worked in windows 3.11 and windows 95 all windows through windows 2003, windows xp. In parallel I was introduced to linux. Initially the only interface I saw in Linux was pico commander. Then all the associates of xwindow system showed up - gnome, kde, xfce. The evolution of interfaces that I learned was from command line to graphical interface. The introduction of graphical interface seemed to be a progress. The introduction of touch screen interfaces that came with the advent of iphone era produced even more confusion. Around that time I graduated from university and started working in enterprise as a java programmer. During my 5 years at the university I participated in ICPC. ICPC is an international competition in programming. You have three people behind one computer and 8-12 programming problems to solve. First two years we were programming in Pascal. Third year we programmed in C++ and then moved to Java and eclipse as an IDE. Java seemed like a progress. Intelligent autocompletion in Eclipse completely blew my mind. Most of the time we weren’t typing - we were tapping ctrl-space and the IDE seemed to have been writing code for us. Every winter and summer we used to go to programming camps in Petrozavodsk. To one of those camps a team from Poland was invited. They were very strong and they were programming C++ in … Vim. This discovery completely threw me off. It was completely unclear to me why they would use Vim. Vim seemed to be something ancient, completely unfit for our twenty first century. I never bothered to spend too much time researching this phenomenon, but it definitely struck me, and I had remembered it. So, when I went to enterprise I was completely confident that I used the most advanced technologies for programming. After a couple of years in the industry I got interested in Vim. It was the only editor available over ssh that we used for programming on remote dev boxes. I had heard the editor was good and I decided to give it a try. So I had been merely playing with Vim until I attended a talk by one of our colleagues - Kirill Ishanov. His introduction to Vim flipped my world. At that time I hadn’t realized all ramifications of my discovery. Now I can tell you what impressed me - Vim was an interpreter of text editing language. Every keystroke in command mode is an instruction in this language. If you want you can put those instructions in a register and execute them in a batch. It’s called macros. You can record macros by entering commands and specifying what register you want to store them in or you can just copy a sequence of letters into this register. Then the whole program would be replayed from this register. That was the moment when I became an ideological proponent of vim. Vim wasn’t just an editor. It was an interactive text processor. Now, getting back to java programming language. At the time when I was programming in java I was under impression that all languages should be or are like java - some variation of c like syntax, imperative in its nature. It seemed normal to write code in an editor, then it would be compiled and executed. Another thing was execution. We used Far manager(clone of Norton Commander) to run our apps. We rarely typed commands in the command line. Command line seemed like something old fashioned. We didn’t see point to use it. At some point we started using it only because it was the only way to communicate to a remote computer over ssh. We didn’t like it. It seemed like a limitation of our abilities. I had had this attitude for command line until I visited the US for the first time. Engineers at the US office were programming in vim and were using command line like it was their editor for entering small programs. I was impressed. I started learning how to use command line as fluently as they did. Though I couldn’t realize the implications of this discovery until I learned the third missing piece - powerful language with expressiveness of python and strictness of java. Before I found this language my understanding of command line was that it should have weird syntax. Haskell completely rocked my world. Its command line allowed me to find out functions' types which served as a good documentation. Most of the time I could infer what functions were doing just based on their name and types. Declarative style of functional programming worked very well with interactive interpreter. Instead of giving instructions you were describing what you wanted to get. This was when I realized that this idea should be taken to the extreme - communication with a computer should happen inside a language interpreter. Communication with your fellow programmers should be done through code. Code is the ultimate way to communicate exactly what you want your computer to do. Every time I hear someone saying that I they’ve achieved something on their computer without writing code and that they avoid writing code because writing code is erroneous it means they just didn’t realize that they wrote a line of code. If you don’t program your computer it means instead of putting your commands for the computer in a batch and executing them, you execute them yourself without recording what you’ve done. It’s even more error prone. It’s much harder to improve this way because now you need to remember what you’ve done last time and you need to be diligent enough to repeat it precisely again. Why bother remembering if you can just record your commands and work with them in a text editor? Text and language are the tools of thousands years old. They are the best so far to communicate information. Visual information, gestures are the most effective. But if you want to preserve your knowledge for some extended period of time then text is the most compact way to do so. If you write code then you record all the steps that you are about to make. You can analyze what you are about to do. You can version your code in the most convenient way that is currently known - version control systems. Also compiler can help you analyze what you do. Even if you use your computer in an interactive way then using command line allows you to extend your vocabulary of commands. You can recall previous commands and reuse them even if you never bothered to add them to you standard library of commands. Computer is a machine that is built to execute commands. Writing code is the best way to interact with your computer if not the only one. Pomodoro technique is a useful time management technique. There have been written a lot about pomodoro technique ever since it was published by Francesco Cirillo in the late 1980-s. The technique recommends using a mechanical timer for measuring time. There are several reasons for using a mechanical timer: ticking timer reminds about pomodoro in progress and presumably boosts focus. Conventional kitchen timers are very nice, but they are not particularly convenient for office environment. They are ticking, and their ringing is too loud and very difficult to adjust. There are many apps for pomodoro technique timer, but I’ve always wanted something that satisfies my requirements and has a physical button rather than a virtual one. I tried retrofitting existing timers and toys. 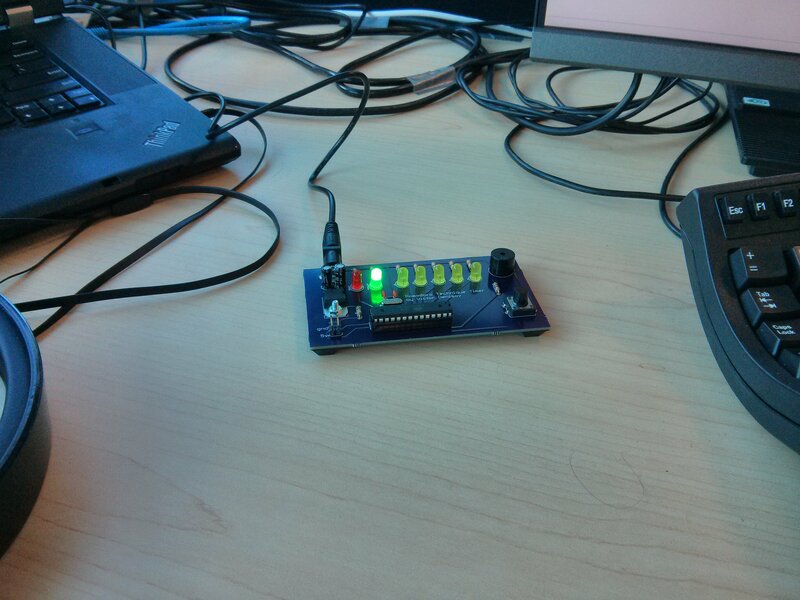 It turned out to be easier to build an electronic timer. It also looks very techy. You can find the eagle project files here. I used oshpark community order for PCBs. You can order this PCB here The firmware is available here I used sparkfun USBtiny ISP to program it. The timer has five binary positions for displaying remaining minutes. It also has LEDs for busy and available mode. You can tell your colleagues that if the light is red then you are busy. The timer goes off with an audible beep. The whole system is designed the way that you can use arduino IDE to compile the firmware and program the device. A general view of the timer. This is the synopsis of the second Linux programming lab. However this solution has a significant limitation. We can’t get words of arbitrary length. Recursive bruteforce can overcome this limitation. The flowchart of the go function is presented below. Recursive brute force can be regarded as a process of spawning a copy of the same function and entering it again with storing the current position. 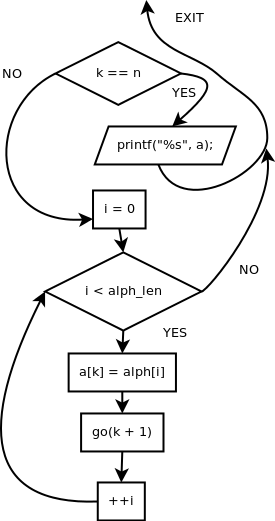 The following flowchart depicts control flow of a program that prints all words of length 4. Green lines mean forward pass. Blue lines mean backward pass when the function returns to the place of its invocation. Black lines stand for inactive paths. Press right mouse button on the image and choose “View image” to see full size image. This is the synopsis of the first Linux programming lab. distributed over the network brute force. Synchronous thread per client solution. Asynchronous thread per client solution. Primitive Makefile for the hello world application. ./hello_world - run the hello world application. Emacs is one of orthodox editors for C programming. linker - the result is executable file. The command line used to compile the application. The C Programming Language. Kernighan, Brian W.; Ritchie, Dennis M.
The Practice of Programming. Kernighan, Brian W.; Rob P.
The Unix Programming Environment. Kernighan, Brian W.; Rob P.
The Standard C Library. Plauger P. J.
UNIX Network Programming, Volume 1: Networking APIs: Sockets and XTI. UNIX Network Programming, Volume 2: Interprocess Communications.